Q: As much as we’d like to have a kid-free wedding celebration, we feel the right thing to do for our friends and family is to include their children. What are some ways we can keep them entertained during the reception so they don’t distract from our big day? A: That’s considerate of you to include your friends’ and family members’ children, and we understand your concern. Having kids at your wedding can definitely change the tone of your event. 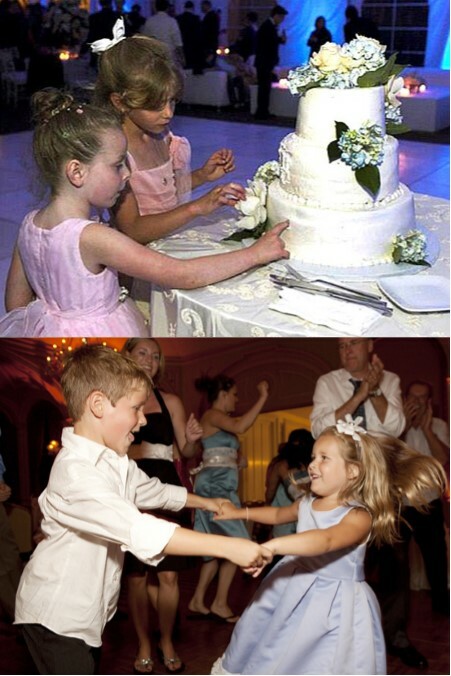 Fortunately, there are many great ways to keep the little ones busy so your wedding day can be what you dreamed. One wonderful option is to bring in hired childcare and set up a room near the reception room, complete with toys and games, videos, kid-friendly food and a dim, quiet area for the youngest to rest if necessary. If a separate room is not possible, you could set up kid tables with coloring books/crayons, puzzles, again engaging sitters to keep the children occupied. Not only is this more fun for the kids, it’s more fun for their parents, too – and it will likely keep them off of the dance floor and out of your spotlight. Good luck! 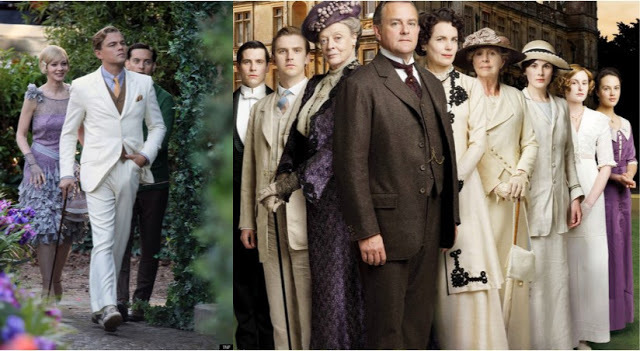 We all know that vintage has been a reigning trend for quite a while now, but with the highly anticipated remake of The Great Gatsby coming out in May and the explosion in popularity of Downton Abbey, the 20’s has skyrocketed to the forefront of wedding theme and design. The always impeccably dressed Great Gatsby (and friends) and the lovely aristocrats of Downton Abbey. We simply love this trend as it affords many opportunities to bring in rich details and an elegance unmatched throughout the ages. You can go the art deco route – gold, feathers, beads…oh, the opulence! Or more vintage – the muted pastels, delicate lace and extravagant floral…just breath-taking! To inspire you to think through possible incorporations of this fabulous trend, we’ve put together these lovely detail boards. 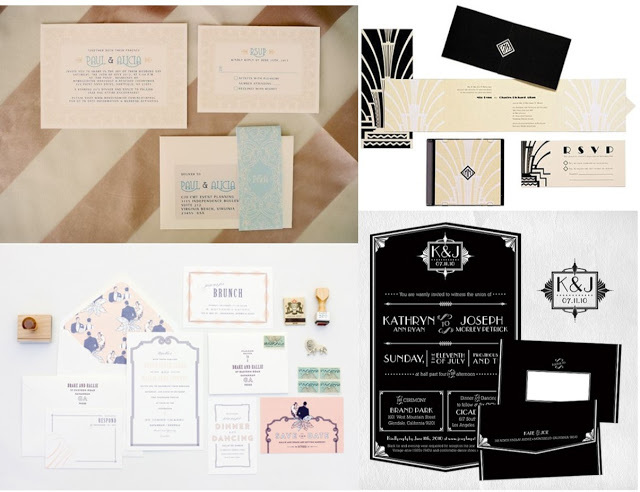 20’s themed wedding stationery truly makes a statement and sets the stage four your Gatsby- or Downton-inspired event! 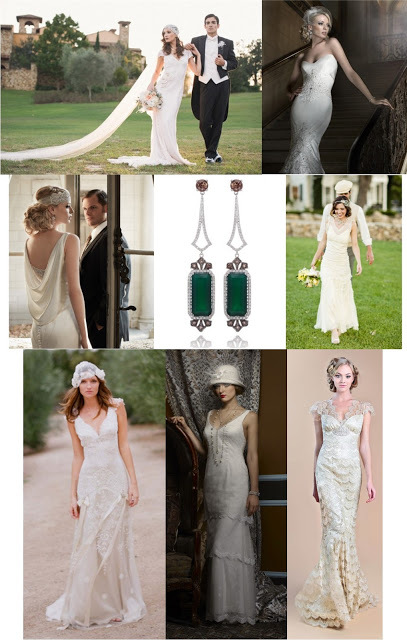 We LOVE apparel and accessories inspired by the 20’s – for brides and grooms! Check out those gorgeous art deco earrings – in the Pantone color of the year, emerald! Love these gorgeous 20’s style bouquets. Oh, the feathers, lace and antique bling! Rich details abound in 20’s-inspired ceremonies. 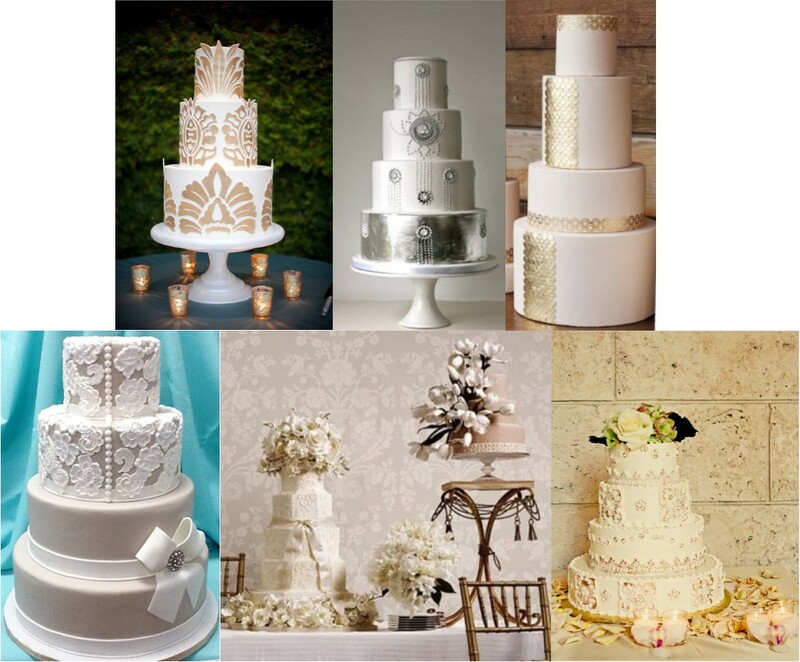 These 20’s era cakes are stunning, whether they feature vintage or art deco design. 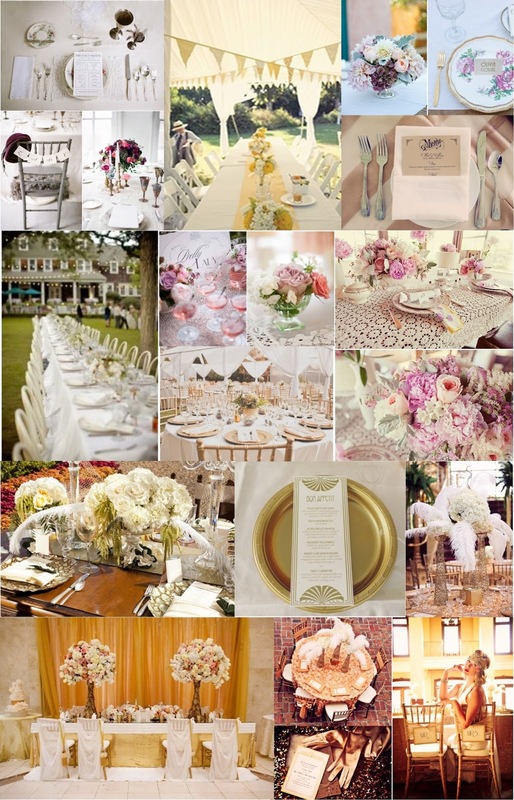 Whether inspired by Great Gatsby or Downton Abbey, these 20’s era reception details make us swoon! One of the most fun to-do’s on your wedding planning list is the cake tasting! 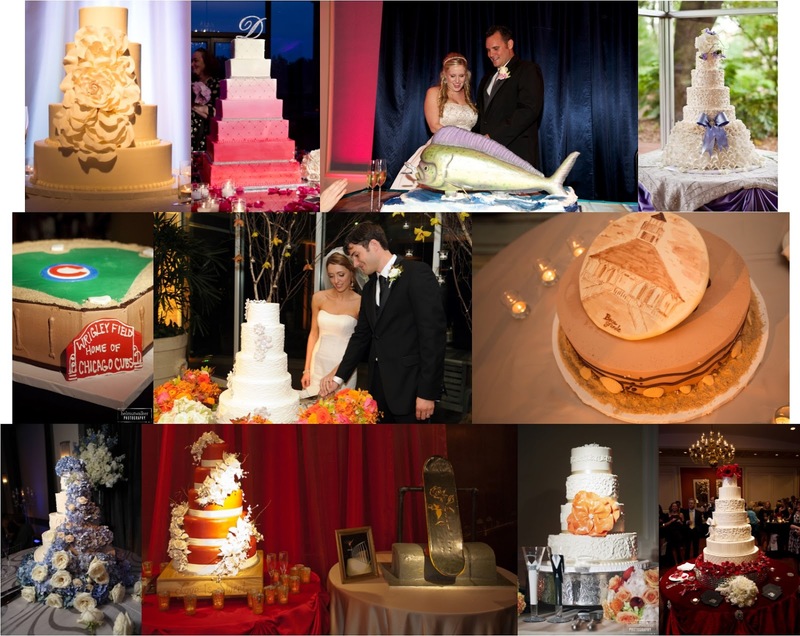 Even if your groom hasn’t been involved much in the planning, he’ll most likely want to attend the cake tasting. While it can be fun, it can also be overwhelming unless you have a plan. You’ll want to schedule tasting appointments with a few bakeries, but no more than three. Do call ahead; all bakeries will require an appointment for a tasting and some of them only do them on certain days. Be prepared. 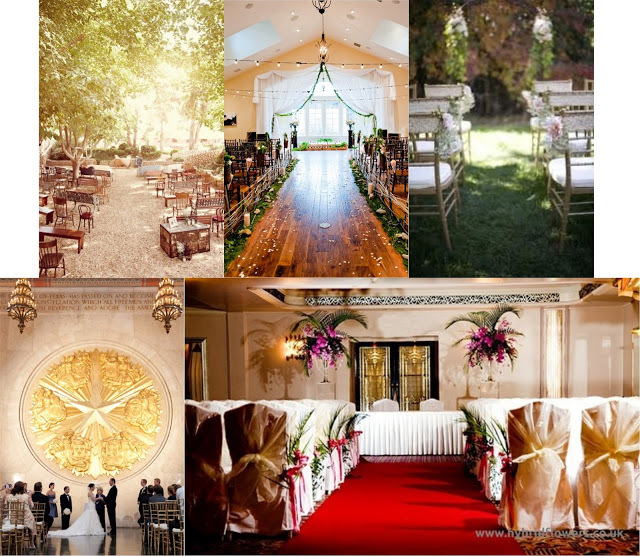 Several details you will want to have a handle on include: your estimated guest count; your budget; the style of your wedding, your gown and floral/décor; your color palette and preferably your reception venue. You’ll want to bring any photos you’ve pulled that represent your style and ideas. Will you have a wedding cake and groom’s cake or are you more interested in cupcakes or some other pastry? Do you have any food allergies or strong flavor preferences or dislikes? There is no point in trying a lemon something or other if you absolutely can’t stand citrus, etc. But also consider your guests and the flavors that will appeal to a majority of them. Each bakery will put their own twist on tastings, but basically, you will have the opportunity to sample a variety of flavors paired with various fillings and/or frostings. Be sure to cleanse your palate between bites of different flavors. Your bakery consultant will direct you. As long as you’re tasting with an experienced, reputable bakery, trust that they know what they are doing and rely on their guidance regarding flavor combinations, design and amount of cake. Most of all, have fun with it! We find this sweet new wedding trend quite delightful. The bride, groom and their guests release “wish lanterns” at the end of the night, usually instead of a traditional send-off with sparklers, confetti, bubbles or what-have-you. It’s beautiful, very impactful and – perhaps surprisingly – environmentally friendly! At the end of the evening, couples (these seem to work best with two people managing them) light the wick, make a wish for the newlyweds and release the lanterns to the sky. It truly is a lovely sight to behold. 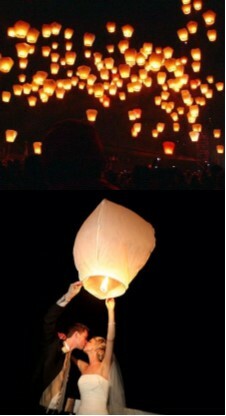 The lanterns are being made with environmentally friendly materials and are completely biodegradable! Look how beautiful this is! 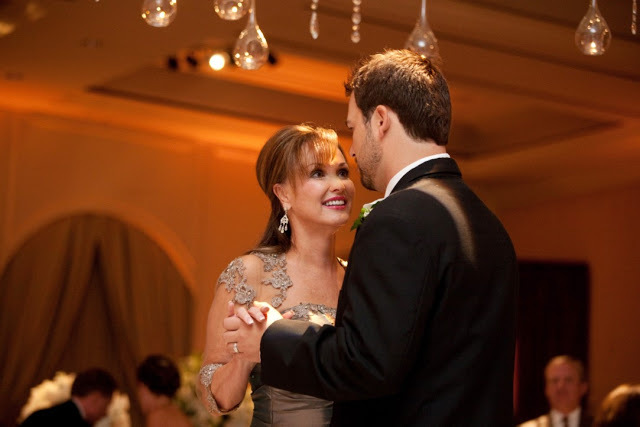 Although the bride is the center of attention on her wedding day, her mother and the groom’s mother usually are the hosts for several of the events surrounding the wedding activities. Whether she is classic in her style, traditional or a bit edgy, we find that moms too want to feel special on the wedding day. We are honored and proud to help dress the other most important women of the wedding day: your mom, your groom’s mom and the grandmothers. If possible, we like to schedule an appointment for at least an hour for a one-on-one session with a stylist in the Special Occasion department of our salon. We review colors, styles, trends and then help with the selection of the best silhouette for her shape, as well as the style of the bride’s wedding. Some of the incredible lines we carry at Stardust include: Damianou, Daymor, Fouy Chov, Rose Taft and many more! Very often, we will custom design a gown or perhaps a wrap or jacket to accompany a strapless gown. Have your special ladies give us a call to schedule their appointment so we can start helping them find their perfect dress for your big day: 972.781.1619.